Market share matters more because it drives network effects which ultimately drive competition out of the market, creating the opportunity for monopoly rents. Profit share matters more because profit is the only fuel that can drive innovation. Any macro downturn or shift in strategy can cause a company to cease investing in unprofitable projects. There are many rich anecdotes to support each strategy, but how about some data? Fortunately we have some: the market and profit shares for vendors covering 80% of the world’s largest technology market over a three year period. The vendors are a good proxy for the market, the time frame is long enough to cover seasonality and anomalies and the market is very big (over 1.2 billion devices) and very broad (world-wide). The only question is how to measure success. One measure is how various strategies benefit the asset owners, i.e. the share holders. Benefit to society, employees and consumers are very difficult to measure. But share holder benefit is easily obtained by measuring change in share prices. 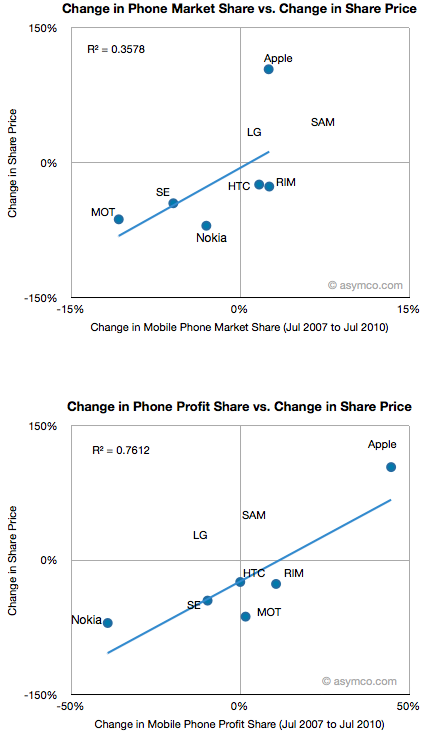 The percent change in market share vs. percent change in share price for the top mobile phone vendors. The percent change in profit share vs. percent change in share price for the same vendors. (see note 1 for time frame discussion). I showed the R-squared value of the correlations. (See note 2 regarding LG and Samsung). At r-squared of 0.36 share price is not well correlated to market share while at 0.76 it is rather well correlated to profit share. To a financial analyst this would seem obvious. After all, share price reflects the present value of future cash flows which are clearly coupled to profit and hence to profit share growth. However, as many technology observers would point out, market share determined the success of Microsoft and Google, and to some degree Nokia. 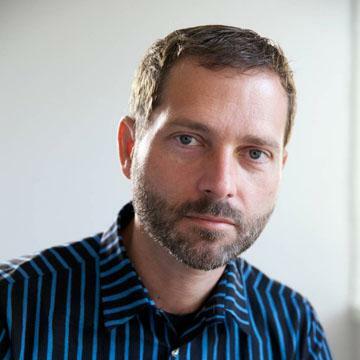 High market share can cause competitors to be starved of components or ecosystem developers. At the same time, high profit share can cause competitors to be starved of capital. What does this analysis add to the argument? Note that this data covers a hardware business. Is hardware relevant? It does not scale as rapidly and has a short shelf life. It’s also notoriously difficult to distribute. However, outside of the service revenues for cellular voice and data, device hardware is the only pool of money that has any material dimension in the industry. It’s also the pool of money with the highest margin in the industry. For the time being and the foreseeable future, hardware is the only business model worth anything in mobile computing. The data shows that in this particular but substantial market profit share is closely correlated to shareholder value creation. It also shows that profit loss is closely correlated with shareholder destruction. The dominant data comes from Apple and Nokia, which appear to be polar opposites in performance on both measures. In other articles I’ve shown how profits have shifted from incumbents to entrants in the smartphone disruption. This shift has resulted in direct benefit and loss to the owners of the two asset classes. To suggest that market share alone is a determinant of “success” in the device market must exclude the effect on shareholders and, ultimately, the management and employees of the companies concerned. The virtuous/vicious cycles will be fed by the profit variable more than any other. I don’t think the market share argument holds water in this market and this data supports my belief. It may be that as value shifts over time away from hardware the benefit will shift as well, but business models alternatives to hardware have not emerged after ten years of experimentation. If anything, the idea of selling hardware as a way of capturing service revenue was pioneered by RIM and perfected by Apple. Nothing I’ve seen so far is challenging this model. Whoever attempts to siphon the device pool of money (which has remained fairly constant over the smartphone disruption) needs to solve system-wide problems like the dependence on the network and the life-cycle of portable electronics. The dates when performance was sampled are are July 1 2007 to July 1 2010. The latest quarter (3Q10) has not been included in this data as it has not been fully reported. The data will be updated with the latest quarter as soon as it’s possible. For many competitors the share price is dependent on more than performance in the mobile phone market. In particular, LG, Samsung, Motorola and Apple have diversified product lines which affect their share prices. Two of those companies (LG and Samsung) are conglomerates and their share performance is dominated by businesses other than mobile so I did not include their data in the correlation measure (though their place on the chart is shown). Motorola and Apple’s stock prices were, to a very large extent, driven by their mobile phone performance over the same period so their data is included in the correlation analysis. The other vendors have been primarily focused on mobile phones.